Dates and Cost: 10 to 30 October, 8 to 28 April, or 22 April to 12 May. 21 Days in Nepal. REDUCED PRICE! - Cost: $2250, £1,450, €1950. Add on a fun climb up Island peak. 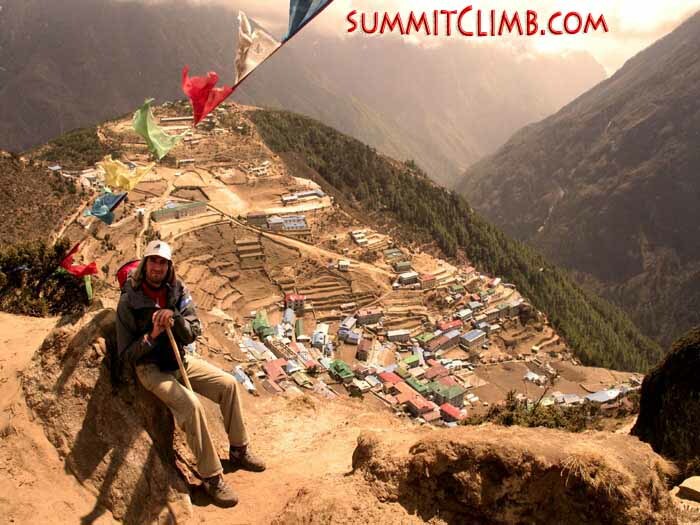 Organizer: Dan Mazur, over 20 years organizing treks and climbs in Nepal. Recent news: Our Everest Basecamp Nepal Trek and Island Peak climb has just returned and it was a huge success. Please click here to view news of our expedition. Please also visit our "Archived News" for more stories of past trips. Explore the beautiful Khumbu region with a knowledgeable glacier recession scientist engaged in current research, visting the amazing blue Gokyo Lake and Everest basecamp. Learn first hand how the glaciers are melting rapidly and receding before our very eyes. 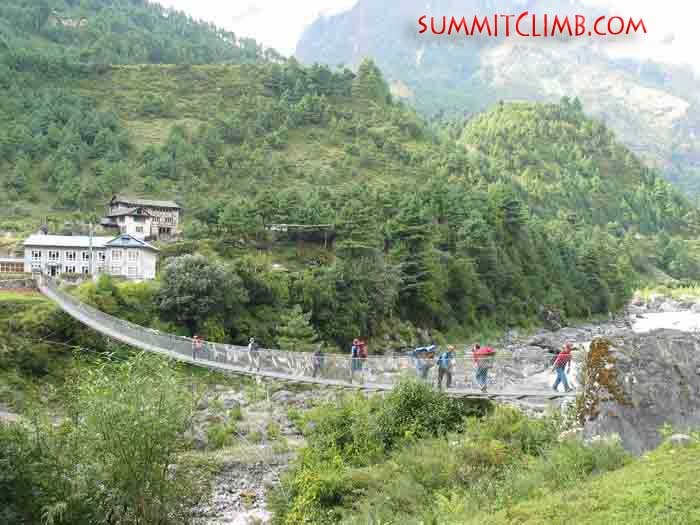 Trek to base camp on snow-free paths through green terraced villages, rushing rivers, suspension bridges, lush forests, stay in civilized 'teahouses' and camp in verdant meadows beneath towering peaks. The Nepal (south) side of Everest is warmer and less windy than the Tibet side of Everest. Please click one of the links below to view that section of our introductory information or just scroll down. (photo below right shows trek leader Ulyana Horodyskyj ). 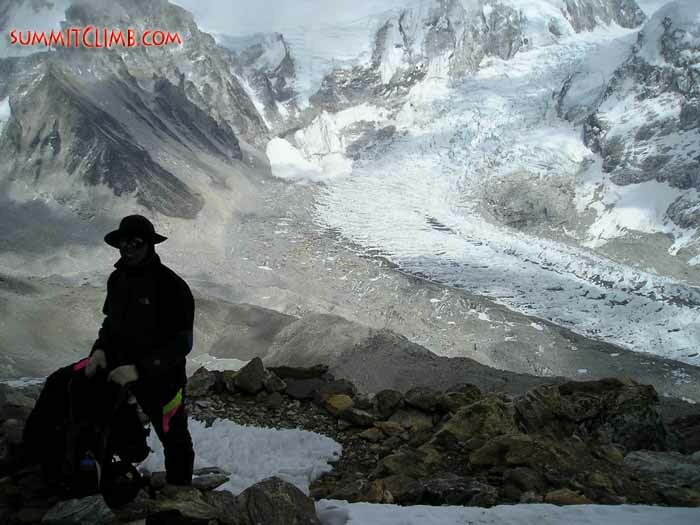 Introduction: On this trek, while walking the beautiful Gokyo Valley, walking to Everest basecamp and up the amazing 'Kala Pattar view Ridge' you will have the opportunity join glacier researcher Dr. Ulyana Horodyskyj and participate in research to understand the rate at which Mount Everest's glaciers are melting. You will help to set up and maintain glacier cameras in action. You will walk (Autumn trek) or paddle an inflatable boat (Spring trek) around glacial lakes, to see, close-up, the collapsing ice walls, as well as collect data first hand. This data helps scientist to understand and forecast the glacier's future. Himalayan glaciers pose an enigma to scientists: they are covered in rocks and dirt, which should insulate (protect) them, yet they are still melting and "down-wasting". 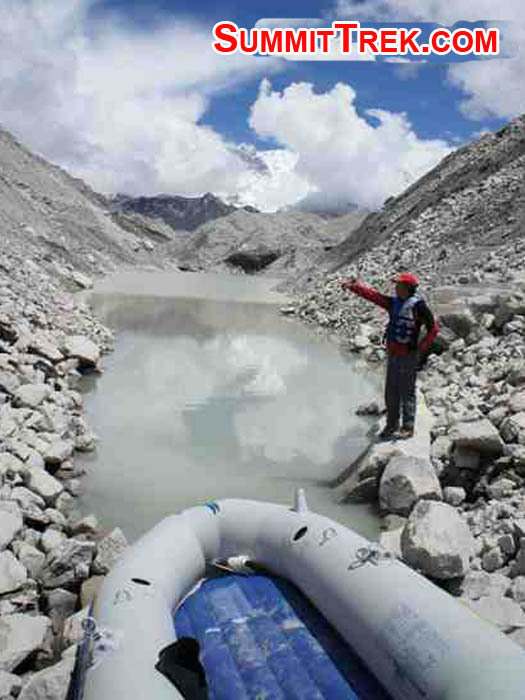 University researchers have been focusing on the Ngozumpa glacier, which flows through Gokyo, and originates on Mount Cho Oyu, the 6th highest peak in the world. This glacier is riddled with supraglacial (surface) lakes. It turns out that the formation of lakes expose bare glacier ice walls, where sunlight can focus its power, leading to enhanced melting and ponding of water. Through time-lapse photography, we have been tracking major inputs and outputs at these lakes (things like rainfall, ice wall collapse, and drain events). Our goal is to determine the life cycles of these lakes and how they contribute to the bigger picture of the (diminishing) life cycle of the glacier. 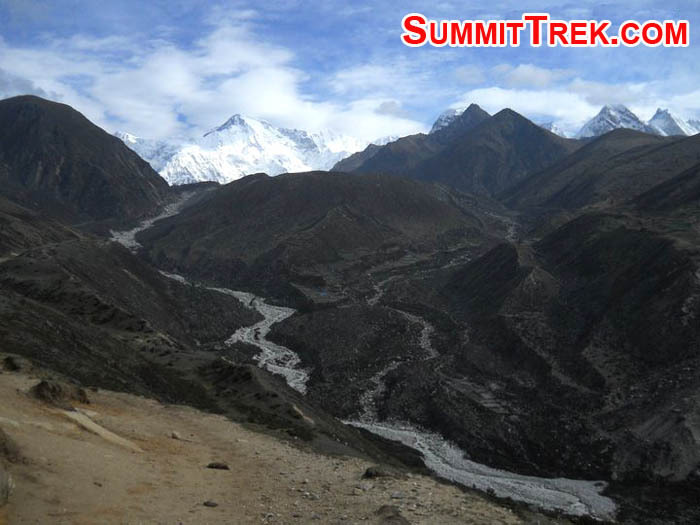 Your participation in this trek will help us to gain an understanding of what is happening to Mount Everest's glaciers. We trek to base camp on snow-free paths through green terraced villages, rushing rivers, suspension bridges, lush forests, stay in civilized 'teahouses' and camp in verdant meadows beneath towering peaks. There is ample time to experience the friendly and exotic culture of the Khumbu Valley, as we walk through some of the most spectacular natural settings and mountain scenery in the world, while staying in comfortable lodgings. Leader and staff:Ulyana is a PhD candidate at CIRES. She has climbed over a dozen peaks over 14,000 ft. in Colorado, Washington, Mexico, Tanzania and Nepal. Our friendly guides and trip leaders are experts at leading interesting groups of men and women throughout Nepal. In addition, they have an intimate knowledge of the Sherpa people and customs and temples and shrines in each picturesque village you stroll through. We must also give credit to our polite and highly experienced, hard-working trekking sherpas, cooking, and office staff (photo right by Tunc Findik: Namche Bazaar at 3,440 metre/11,300 feet, the capital of the Sherpa people. See this unique village on our trek to and from basecamp). We encourage men and women from around the world, of all ages to join us as an individual team member or with your own group, whether that is your spouse, partner, friends, sibling, clients, colleagues, etc. Most of our members join as individuals, our team dynamics work well, and we are able to build successful and safe groups of people that enjoy trekking, climbing, and traveling together (photo right by Dan Mazur: Our trek team is having fun on the way to Namche Bazaar. What a great group!). Please "click" one of the links on the column on the upper right of your screen under "Climate Change Trek" to learn more about our trip. Trek Leader: Ang Sangay and staff, fluent English speaker with over 10 years leading treks and climbs in Nepal. Your trip includes 2 free Kathmandu hotel nights at the beginning and two free Kathmandu hotel nights at the end of the trip. You will be sharing. If you want your own single room, the cost is an aditional $32 per night (during the included four free hotel nights) and for extra nights $65 per person for single occupancy. Please bring extra cash to pay for your extra nights and / or your single supplement. We often stay at the comfortable three star Hotel Shakti. Its an excellent and classic hotel surrounded by green gardens and located in the heart of the city action near many delicious restaurants, the city's best mountain equipment shopping, and abundant nightlife all within a few minutes walk. The Shakti also offers lots of entertaining day trip (and night outing) options such as city tours, walking tours, rock climbing, mountain biking, wild game safaris, horse back riding, art classes, volunteer opportunities at orphanages, hospitals, schools, women's centres, bird watching, cooking classes, sport fishing, day peak climbing, herbal medicine seminars, day hikes, pottery classes, car tours, sightseeing, temple tours, henna handpainting classes, massage, swimming, beauty salon, motorbiking, yoga retreats, river rafting, painting classes, golf, language courses, kayaking, writing seminars, bungie jumping, religious worship, canyoning, hot tubs, health club, saunas, fitness center, spa treatments, Mount Kailash Treks, night clubs, meditation retreats, gourmet restaurants, cultural dance performances, wine tasting, pedicures and manicures, casino gambling, barber shop, discotheques, airport transfers, Scenic flights around Mount Everest and much much more. Sherpas and Equipment Transport: Our trek includes transport of all of your equipment from Kathmandu to your destination, and returned to Kathmandu. While on the trek, we DO NOT ask our members to carry heavy group equipment (although it is an option if you really want to), such as tents, rope, fuel, food, etcetera. 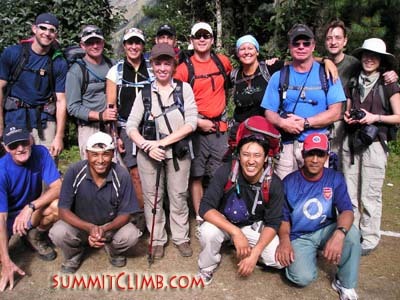 We employ climbing sherpas, and high-altitude porters, to carry group equipment and supplies. Climate Change Trek daily itinerary, please scroll down. 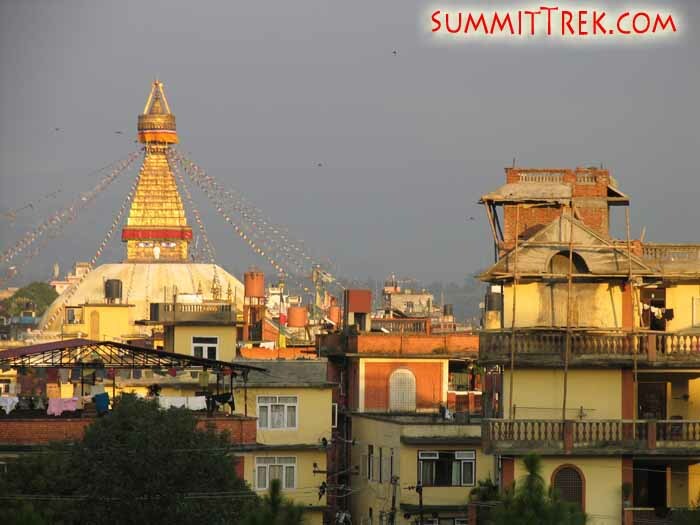 This day provides an opportunity for additional touring of Kathmandu area. Team dinner.Make arrangements to leave unnecessary gear at hotel while on trek. 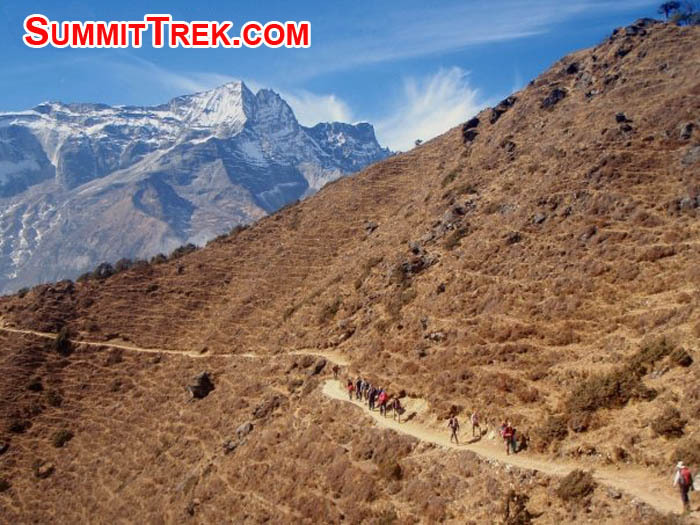 After arriving at the Tenzing-Hillary Airport at Lukla we will organize porters and load yaks for the trek. The airport was built by Sir Edmund Hillary in 1964 to support his charitable work. Short trek to Phakding where we will spend the night in a teahouse. 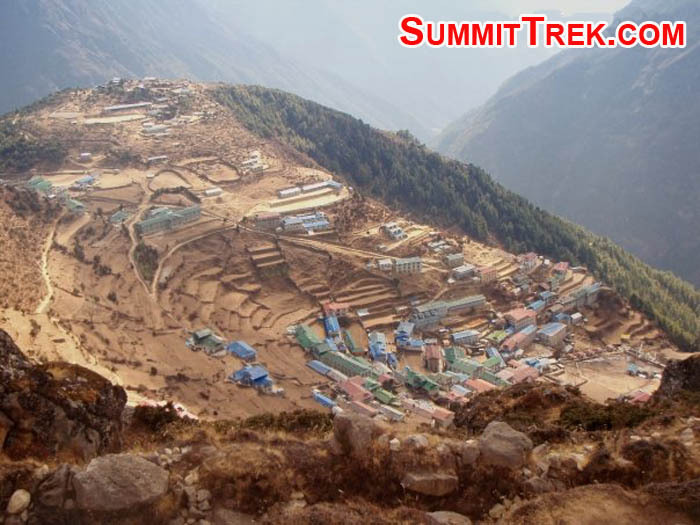 Namche Bazaar is the Sherpa capital and has the headquarters for the Sagarmatha National Park. The extra day at Namche is to help with altitude acclimation. 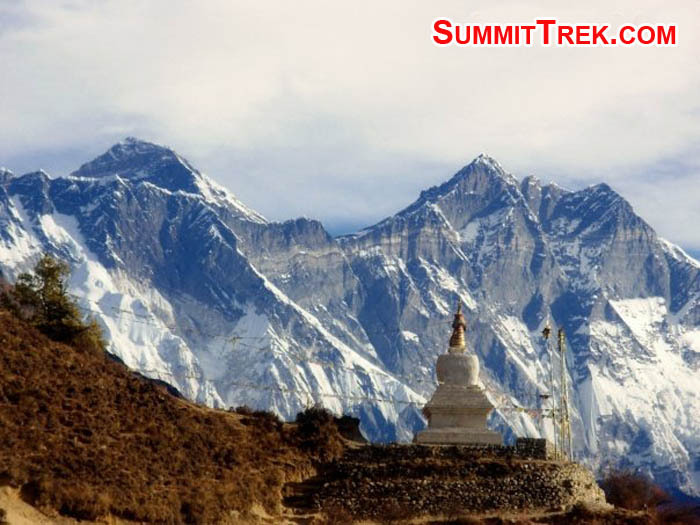 While there, a person can visit the Sherpa Cultural Center and/or take a short hike to places such as the Sherpa village of Thame or to a place on the Thyangboche trail with dramatic views of Everest, Ama Dablam, Lhotse and Nuptse. Phortse is a Sherpa village. Machermo is the site of a reported Yeti attack. In 1974 a Sherpa girl was knocked down by a Yeti that then killed three of her yaks by breaking their necks. This is a short day, so it is possible that we will push on to Goyko. Goykois on the edge of the dramatic and holy Gokyo Lakes. There will be climate change talks on the moraine. It is a short 20 minute hike to the moraine from the village. 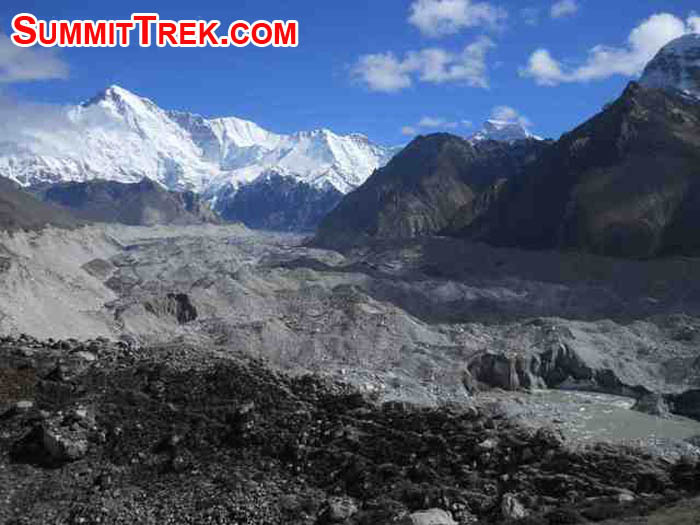 The Ngozumpa glacier moraine, five glacier lakes and the Cho Oyu Base Camp are accessible from Gokyo. 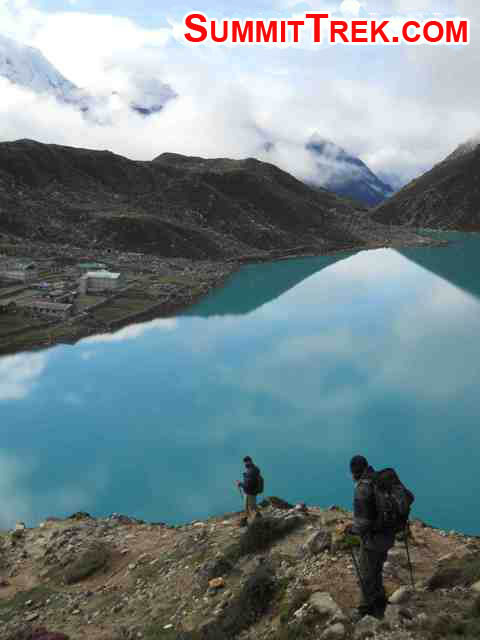 From Gokyo there will also be an opportunity to trek 550m/1800ftto the top of Gokyo Ri Mountain (5,340m/17,520ft). GokyoRi is a steeper version of Kala Pattar the mountain near Gorak Shep and the Everest Base Camp. GokyoRi has the one of the finest views of Everest. Weather permitting you will be able to see Everest, Ama Dablam, Cho Oyu, Lhotse, Ngozumpa Kang and many other Himalayan peaks. 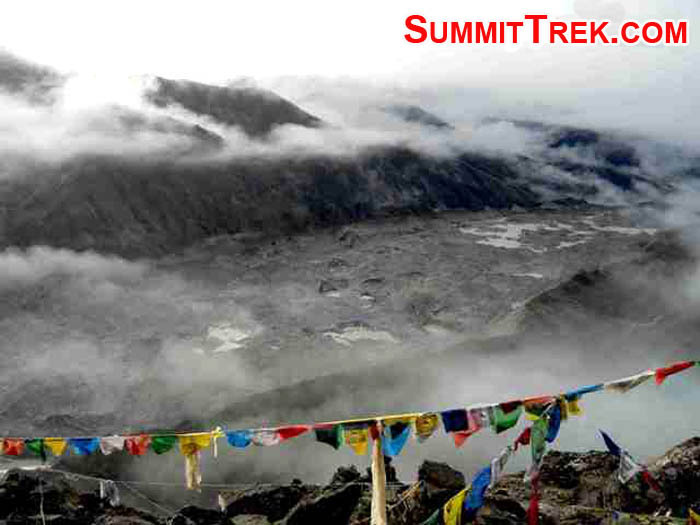 There will be an opportunity to camp at Ngozumpa Glacier. Trek across Cho La Pass to Dzongla. Cho La Pass is links the Goyko to the Tschola valley. Conditions can vary according to weather. It can be an easy rock scramble or may involve a snow adventure. The east side of Cho La can be snowy or icy. If icy, trekkers may require crampons, an ice axe and will be roped. There are stunning views at Gorak Shep. This is a rest day. 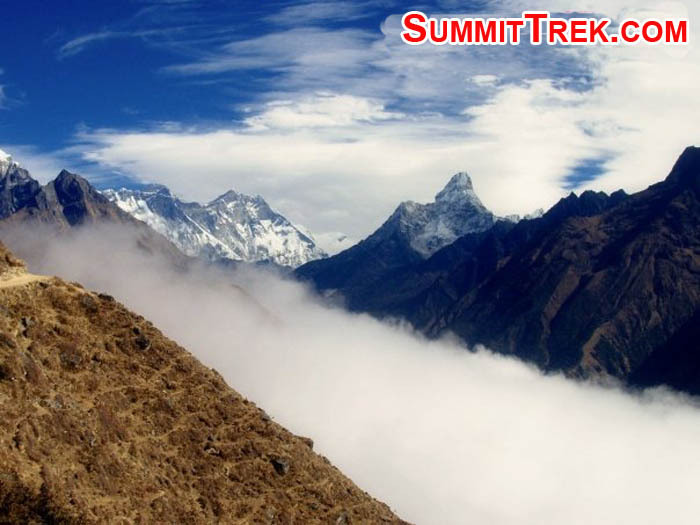 We will trek to the Everest Base Camp. Its pans a large area. 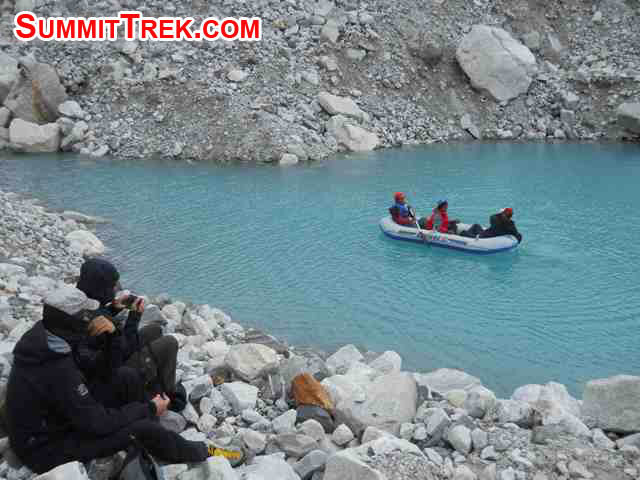 We will have an opportunity to explore the Khumbu Glacier lake on a rubber raft and to do ice climbing on the Khumbi. Khumbi Climbing School Sherpas may participate. Check into pre-booked BB plan hotel, pick up any gear left at Kathmandu while trekking.This day is an opportunity to see Kathmandu area sights. The trek has an extra day in Kathmandu built into the return to accommodate a possible Lukla to Kathmandu flight cancelation. Check out of hotel and fly home. Thank you for joining our Climate Change Trek. 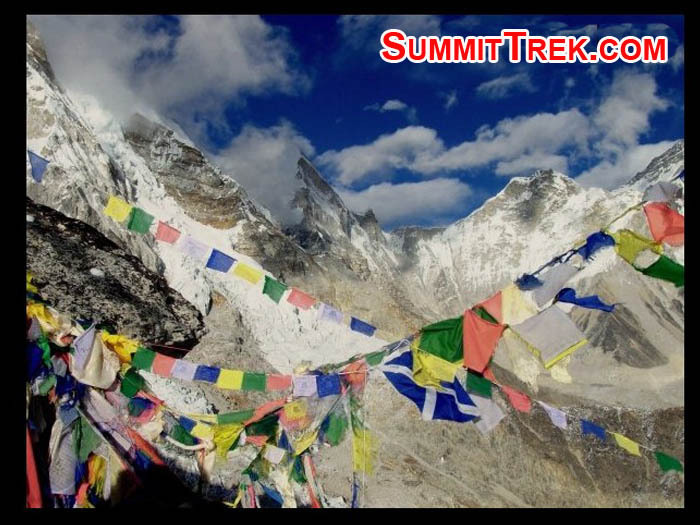 Please click one of the links below to view that section for the route on the Everest Basecamp Trek, or scroll down. 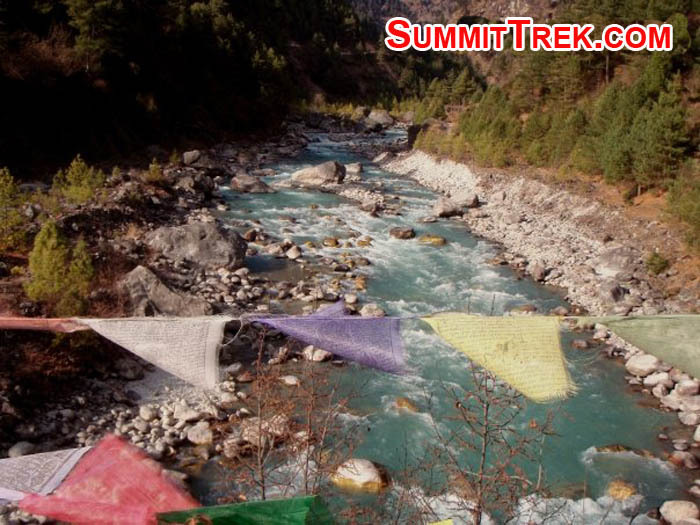 This easy, peaceful and interesting trek to Everest maximizes many years of accumulated wisdom in the Himalaya, a long and proven record of safe and fun trekking through Nepal, Tibet, China, Africa, and many other facinating destinations around the world. 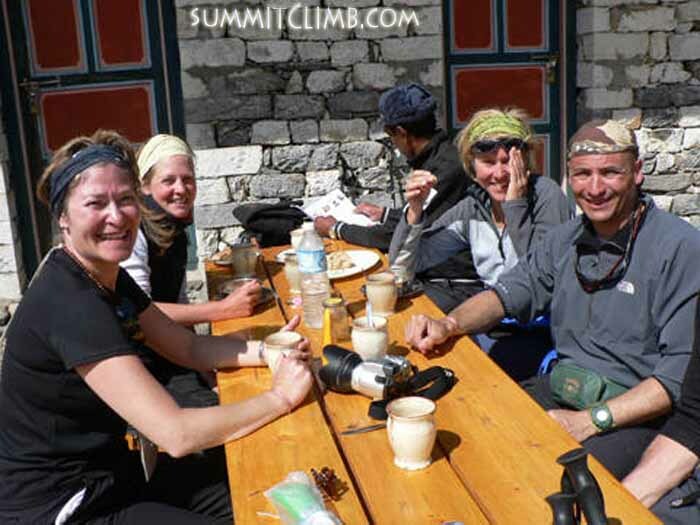 Our friendly guides and trip leaders are experts at leading interesting groups of men and women throughout Nepal. In addition, they have an intimate knowledge of the Sherpa people and customs and temples and shrines in each picturesque village you stroll through. We must also give credit to our polite and highly experienced, hard-working trekking sherpas, cooking, and office staff. Many of these excellent sherpas who work for us have an intimate knowledge of the beautiful trek to Everest and the comfortable villages we will visit, because this is their home region. They live in this land grew up on farms here, have family and friends in the fun areas we will pass through, making our visit less of the usual tourist experience and more involved with the unique and genuine culture of the Khumbu Valley. They go out of their way to help make your visit remarkable, enjoyable along the way, and create lasting ties with the majestic landscapes and the inhabitants who reside there. This is a truly wonderful trek with an enthusiastic and polite group of friends. 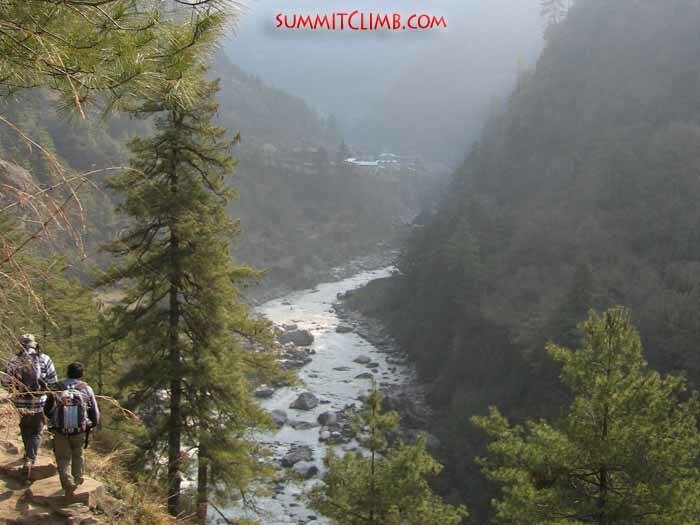 Would you like to be involved in charity/service "non-profit" work in the Khumbu valley? Please visit our Service Trek site to learn more. The proposed itinerary allows enough time for proper acclimatization and rest days. The weather at this time of year is normally quite good and stable. However, we all know the global weather is changing, and in case of storms, you will note the proposed itinerary includes extra days as well. From Namche we drop down to the river and the famous tea-stop of Fungki Thangka and have a steep climb up through tree nurseries where you could help with the replanting of the Khumbu valley, which is starting to show signs of over-forestation by sherpas heating water for trekker's hot showers. If you are interested in helping, please check out our Service Trek website. Throughout this part of the walk, be sure to keep your eyes peeled for a glimpse of endangered herds of Tahr. Finally cresting a rise in a forest of gorgeous Sub-alpine fir and Hemlock, walking at the feet of the Khumbu giant peaks of Kusum Kanguru and Thamserku, we reach the Buddhist monastery at Thyangboche, which we can visit. The monastery burned in 1989, apparently due to an electric kettle being left on. Tragically the gompa's book collection was ravaged, and during the following years, groups of monks were seen spending hours each day writing with ball-point pens on stenographer's pads, trying to recall ancient texts from memory, which were burned when the fire tore through the library. Here we will find inspiring views of Everest , Nuptse, Lhotse , Ama Dablam , and a very welcome tea and lunch stop. At the gompa of Thyangboche, which burned in 1989, Steve doing some exploring (Liz Stevens). The Pangboche Lama blesses all of us. Here he is blessing our trek employee and trek leader, Ms. Kandu Sherpa. Kandu's sister Maya works for SummitClimb and has become the first Nepalese woman to climb Ama Dablam , Pumori, and Cho Oyu . Kandu would also like to become a climbing Sherpa one day (Liz Stevens). The next morning we enjoy a walk along the beautiful Dudh Kosi gorge, to the enourmous flat valley where lies the village of Pheriche. At 4,250 metres/13,900 feet, it’s where the famous Himalayan Rescue Association (HRA) health clinic is located. Pheriche is the last permanent Sherpa settlement. 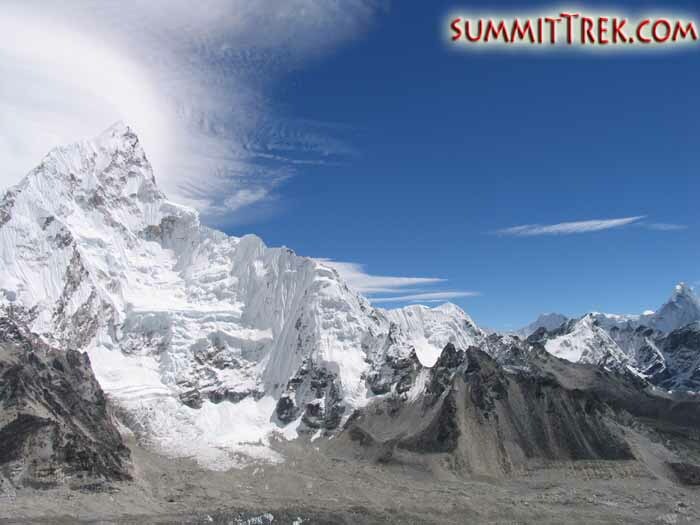 Here we have spectacular views of Nuptse, Lobuche, Cholatse, Ama Dablam and many others. Monuments to fallen climbers, known as "chortens" atop the Dugla Hill, with Ama Dablam in the background (Steve Miscione). The view of Lobuche peak from the teahouse at Lobuche at 4,930 metres/16,200 feet (Liz Stevens). Leadership: During the full-service trek, you will benefit from the leadership provided by Ulyana Nadia Horodyskyj. She was born in February 1986 in Rochester, New York. By the age of 6, she had her first taste of the mountains: the Swiss Alps, where she witnessed her first avalanche. Since then, Ulyana has traveled to all 7 continents, with experiences ranging from working on the back deck of an icebreaker in Antarctica to climbing Kilimanjaro in Africa. She has climbed over a dozen peaks over 14,000 ft. in Colorado, Washington, Mexico, Tanzania and Nepal. Currently, Ulyana is a PhD candidate at the Cooperative Institute for Research in Environmental Sciences (CIRES) at the University of Colorado Boulder. Her PhD work focuses on the changing state of the Himalayan glaciers, through the use of field instruments and time-lapse photography. She is fluent in English and Ukrainian. For more about Ulyana Nadia Horodyskyj, please click here. Organization: Your expedition is organized by our British, European, American, Nepalese, Tibetan, and Chinese office personnel working on-the-ground together as well as in your home-country. For example, one of our lead organizers is the very experienced Dan Mazur, trekking in Nepal since 1986 and climber-leader-organizer of Everest, K2, and 12 "eight-thousand-metre-peaks". He is a relaxed, friendly and well organized person, and a highly-skilled professional with 25 years experience in helping people explore the mountains, with the highest attention to detail, comfort, and safety. For more about organizers, leaders, sherpa, and staff, please "click" here . Sherpas: We hire Sherpas and high altitude porters in a support capacity, and now have 23 of these very experienced, friendly, strong, helpful, and loyal people on our staff, including some of Nepal's best climbers and some of Nepal's only women Sherpas. Some of our Sherpas have been to the summit of Everest more than 7 times and led treks to Everest Basecamp & up Island Peak countless times. One of our lady sherpas just became the first Nepalese woman to reach the summit of Ama Dablam, Pumori, and Cho Oyu. Many of our sherpas have personally assisted foreign climbers to the summits of more than ten of the highest peaks in the Himalaya. We hope that you will arrive for your Climate Change Trek in good health, both mentally and physically prepared, so we can work together as a team and have a successful expedition. Please go to our personal & team equipment section of the "Everest Basecamp Trek Nepal Questions" for additional information and detailed discussion of the equipment lists below. For water purification you may wish to bring a SteriPEN or some other sort of Ultra VioletPurifers? Please note that with the SteriPenyou may have difficulty with it at the higher altitudes, due to the cold. So, you would have to bring plenty of extra batteries - the lithium kinds are preferable. As a back-up, please bring iodine pills or something similar. For prices at Kathmandu shops, please "click here" . For information about using your credit, bank, cash, ATM card in Nepal, please "click here" . For more information about how much cash to bring for a Everest Basecamp Trek, please "click here" . 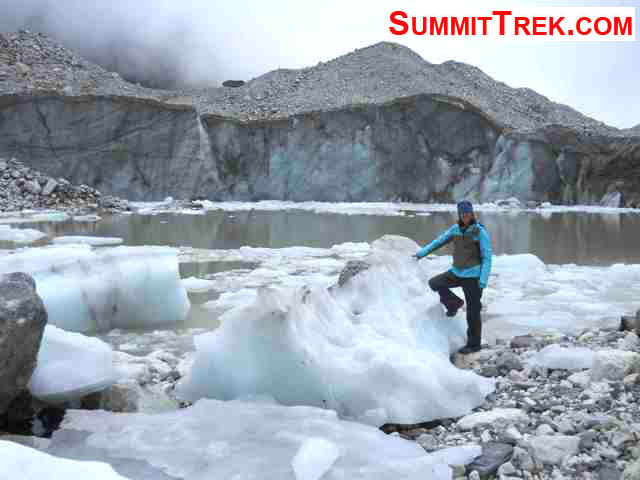 Throughout the trek temperatures can vary from 27Â°c to -7Â°c ( 80Â°f to 20Â°f). At night we stay in warm, comfortable teahouse lodges for most of the trek. The wind is the most chilling factor, and can be quite variable, with everything from a flat calm, to brisk at basecamp. There may be snow, rain, mosquitoes in wet areas, blowing dust, heat, and bright sunshine. It is slightly chillier during April trip than in May or October. The coldest portion of the trek is the morning we walk up Kala Patar, where it can get below freezing on average. Please click here to view our Climate Change Trek leadership page for more about our leader, organizer, sherpas, and staff. Your expedition is organized by our British, European, American, Nepalese, Tibetan, and Chinese office personnel working on-the-ground together as well as in your home-country. For example, one of our lead organizers is the very experienced Dan Mazur, trekking in Nepal since 1986 and climber-leader-organizer of Everest, K2, and 12 "eight-thousand-metre-peaks". He is a relaxed, friendly and well organized person, and a highly-skilled professional with 25 years experience in helping people explore the mountains, with the highest attention to detail, comfort, and safety. For more about organizers, leaders, sherpa, and staff, please "click" here . Yes you can pay a porter a few hundred Rupees to wash your clothes if you don’t want to do it yourself. We currently charge $100 USD per day for members who wish to extend their stay in basecamp. Please indicate the number of extra days you wish to stay in basecamp on your application so we can arrange this for you. 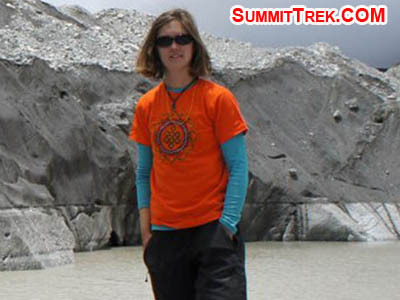 The youngest trekker we have had for the Trekking in Nepal was 18. Our trek includes transport of all of your equipment from Kathmandu to your destination, and returned to Kathmandu. 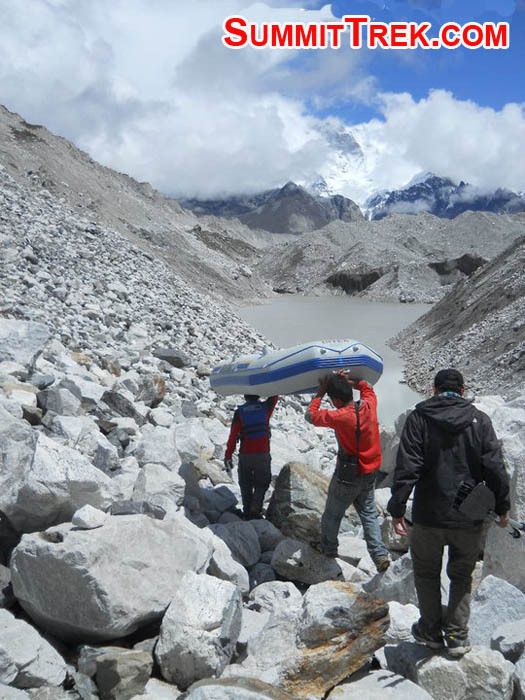 While on the trek, we DO NOT ask our members to carry heavy group equipment (although it is an option if you really want to), such as tents, rope, fuel, food, etcetera. 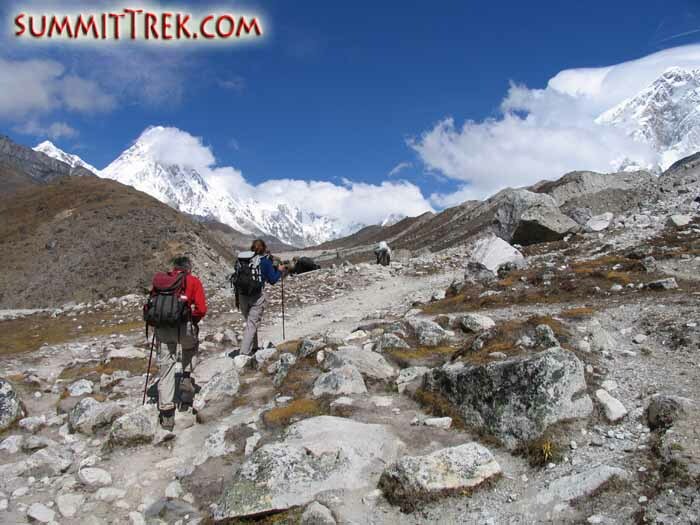 We employ trekking sherpas, and porters, to carry group equipment and supplies. 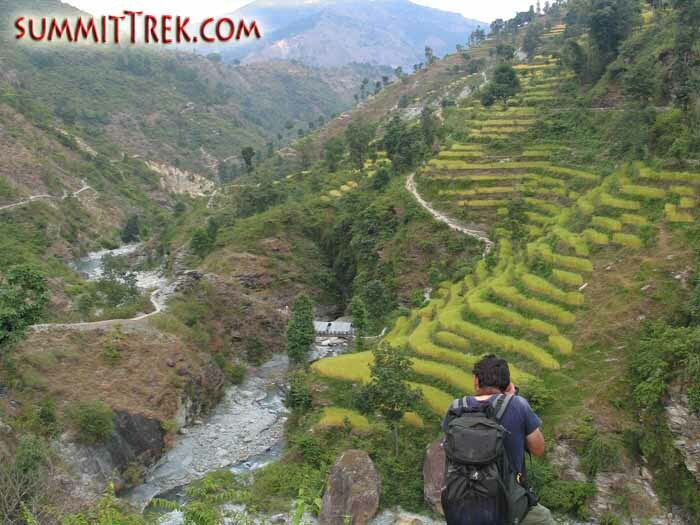 You will only need to carry a small day-pack/rucksack along the trek with your water, jacket, camera, etcetera. For information about using your credit, bank, cash, ATM card in Nepal, please "click here". For more information about how much cash to bring for an Climate Change, please "click here". Please visit the medical section of the Climate Change Trek Personal & Team Equipment link to view a full list of the medicines we recommend you purchase inexpensively in Kathmandu, without a doctor's prescription, before departing for the mountain. For starters, we recommend you check the internet, on websites such as www.Expedia.com , www.Orbitz.com , www. Kayak.com, etc . If you would like to work with a travel agent, please contact Sue at Unique Travel: 503-221-1719. Another travel agency you may wish to check prices with is: Himalayan Treasures and Travels 800-223-1813, or Bootsnall.com 503-528-1005. Be sure to mention that you are one of our members when you ring your travel agent, as the above companies arrange quite a few of our flights and they may give a discount or provide extra baggage allowance. By the way, before booking your ticket, please check the itinerary carefully and check how much baggage they will allow. In case you have excess baggage, you may wish to ring your airline and request their "sport baggage allowance". Many airlines allow it, and often provide this for golfers, bicyclists, surfers and skiers. Quite often they extend it to climbers. Some of our members have had good luck bringing a ski bag and filling it with climbing equipment. Before arranging cargo shipping, ring your airline and explain what you are climbing/trekking and need to bring extra food/equipment, etcetera. Airlines often allow you to carry extra bags when you fly for a reduced charge, when you arrange it all in advance. The big advantage is that the bags should travel with you all of the time, don't have to be cleared through customs, etcetera. BAGGAGE WARNING: They might not give the same allowance on the inbound portion. Be sure to check this and request it if not given, or you could incur high baggage charges when coming home. The documentation of this allowance may take the form of a letter from the baggage officer at the airlines, or the allowance may be printed on the ticket itself (the best form of documentation by far). Your trip includes 2 free Kathmandu hotel nights at the beginning and two free Kathmandu hotel nights at the end of the trip. You will be sharing. If you want your own single room, the cost is an aditional $32 per night (during the included four free hotel nights) and for extra nights $65 per person for single occupancy. Please bring extra cash to pay for your extra nights and / or your single supplement. We often stay at the comfortable three star Hotel Shakti. Its an excellent and classic hotel surrounded by green gardens and located in the heart of the city action near many delicious restaurants, the city's best mountain equipment shopping, and abundant nightlife all within a few minutes walk. The Shakti also offers lots of entertaining day trip (and night outing) options such as city tours, walking tours, rock climbing, mountain biking, wild game safaris, horse back riding, art classes, volunteer opportunities at orphanages, hospitals, schools, women's centres, bird watching, cooking classes, sport fishing, day peak climbing, herbal medicine seminars, day hikes, pottery classes, car tours, sightseeing, temple tours, henna handpainting classes, massage, swimming, beauty salon, motorbiking, yoga retreats, river rafting, painting classes, golf, language courses, kayaking, writing seminars, bungie jumping, religious worship, canyoning, hot tubs, health club, saunas, fitness center, spa treatments, Mount Kailash Treks, night clubs, meditation retreats, gourmet restaurants, cultural dance performances, wine tasting, pedicures and manicures, casino gambling, barber shop, discotheques, airport transfers, Scenic flights around Mount Everest and much much more. Meals in Kathmandu are at your expense. For information about using your credit, bank, cash, ATM card in Nepal, please "click here" . For more information about how much cash to bring for a Everest Basecamp Trek, please "click here" . For the most part, we will be staying in teahouses. October tends to get crowded, as it is a main trekking season. So, camping is the alternative. Day/Night 10 could be a potential camping out on the glacier. This is optional as we want to make this your experience as much as possible so we will be flexible and open to ideas along the way. I will research more and we can add to that in a few days time. 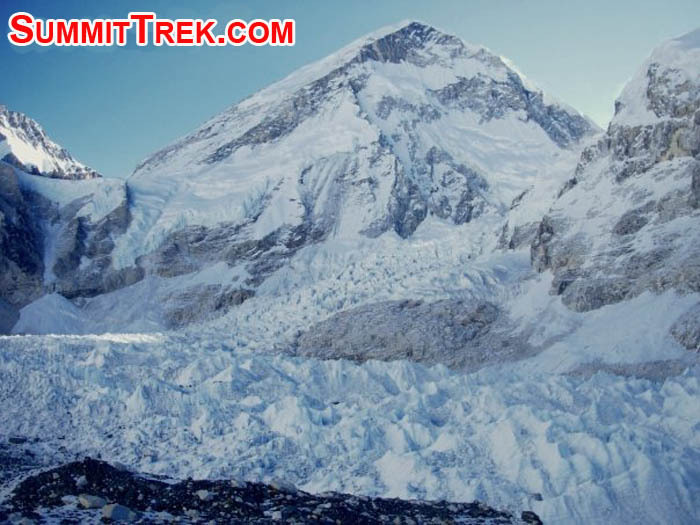 We will be expanding this section with more Everest Basecamp Trek Nepal video clips. What questions do you have? Please ask as many questions as possible. This helps us to have a proper conversation so we can better understand one-another's expectations, so you will have a very safe, enjoyable, and successful trek. Thank you. Before completing the application forms, please be sure to carefully study the Everest Basecamp Trek Nepal "Questions" website for information regarding flights, payment, team members, application forms, insurance, etcetera: Everest Basecamp Trek Nepal Frequently Asked Questions .